Several types of online tools allow you to engage home buyers by supplying them with quality information. Thanks to these tools, the length of time spent visiting your website increases in addition to the number of information requests regarding your selection of available houses. Capturing and retaining the attention of these visitors is essential, and even more so when we consider that 99% of visitors to a home builder site leave it without having taken any action, such signing up to receive a newsletter or requesting information and/or a meeting, etc. Builders not offering an engaging experience on their website are generally unable to capitalize on investments made for managing online contacts. What are the elements preferred by buyers when doing research on a builder’s site, and how can you create engaging experiences that allow you to direct visitors toward your sales funnel? An image (whether a photo, computer graphic, or 3D perspective) is worth a thousand words. This is a saying that is becoming more and more true, especially when we consider that 81% of internet users only skim the content they read online. On social media, posts containing images have an engagement that’s 650% higher than posts containing only text. The explosion of applications like Pinterest, Tumblr, and Instagram only confirms this trend toward photos. Images speak to our emotions and appeal to the emotions of prospective home buyers. It’s the best way to capture their attention. Therefore, it’s in every home builder’s interest to include images in all marketing materials, including image galleries on their sites, catalogs of models, home/lot listings, Facebook and/or Instagram posts, and promotional images displayed in sales offices. 92% of buyers state that images displayed in offices influence their choice of home builder. And for all categories of buyers, whatever their budget, home-buying experience, location or age, at least 90% of them consider images essential to their decision-making process. In other words, CMI professionals who have an extensive portfolio of professional quality images enjoy a major advantage that words alone cannot express, especially in the draft phase. These images can, for example, be used to distinguish a list of homes on a website and can become a true entry point for future buyers. Having a way to produce a significant stock of quality home perspectives through the use of 3D architectural software or home construction software for creating floor plans and 3D views, is becoming a strategic concern. Buyers today are accustomed to visualization tools. The majority of them don’t know how to read a technical plan, and therefore are not able to visualize themselves in their home project just by looking at a simple plan. Naming a room “kitchen” or “great room” as well as giving its dimensions is insufficient information for visualizing. 2D plans can be augmented by photo galleries and 3D videos that give life to a space. 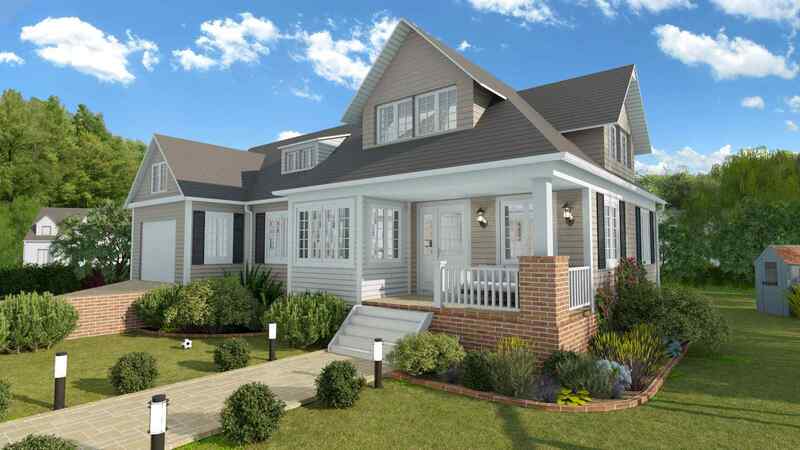 But it’s really the 3D floor plan that constitutes the best way to help a buyer understand a project in its entirety. These axonometric views, which can present a personalized 3D layout are an essential tool for builders. A 3D floor plan can be easily managed using professional construction software. 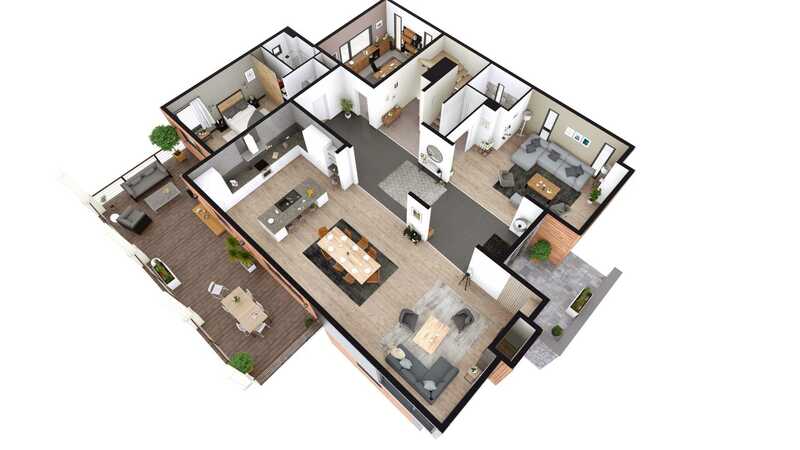 Many buyers will need these enhanced 3D views of the floor plan to understand how the spaces in the house connect, and this is a significant competitive advantage for builders offering it. Cisco predicts that in 2019, video traffic will make up 80% of overall internet traffic. Real estate advertising with videos will receive four times more requests for information than advertising without. Videos allow you to significantly increase engagement, duration of visits, visitor returns to your site, sharing of pages and, ultimately, conversion. This format can be used for both visiting model homes and construction sites, and for recording client testimonials. Are you looking to improve your brand recognition or encourage prospects to call you to schedule a model home visit? Use different types of videos according to the objectives you’re looking to achieve. The video content you create can be reused in various ways beyond your site: on social media, in real estate advertising or on the screens in your office.